I have mentioned a couple of times that in my opinion, the so-called “comprehensive income” is a much better indicator for shareholder wealth created than net income or earnings per share. In my experience, almost no one cares to look at what happens after the net income line. Usually, comprehensive income is stated on a separate page anyway. The first thought is of course “Yippie yeah”, a really significant earnings increase, P&E of 4 etc etc. The highest earnings yield ever calculated by the Human Screen is 35%. It’s so high, he’s wondering if air line and road-haulier Dart has bust his value yard-stick. 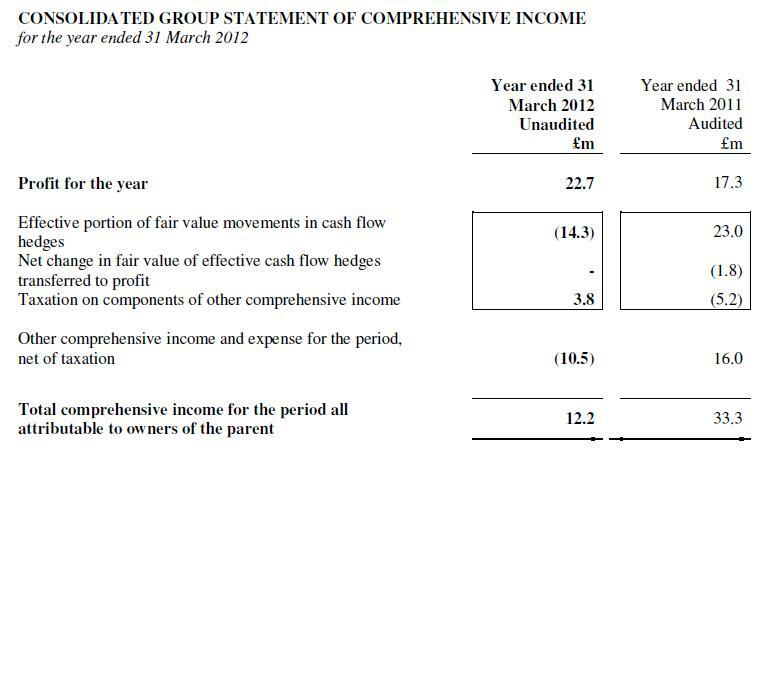 So we have additional items which significantly decreased shareholders equity but didn’t need to be recorded in normal earnings but comprehensive income. In this case we are looking at fuel hedges. – Minimum pension liability adjustments. Normally people would argue that those items are “non operating” and therefore not or less relevant. However, as it affects shareholder value, in my opinion it is very important to look at those item to determine real value creation for the shareholder. The result of the fuel hedges should be treated as part of the normal business of Dart Group. 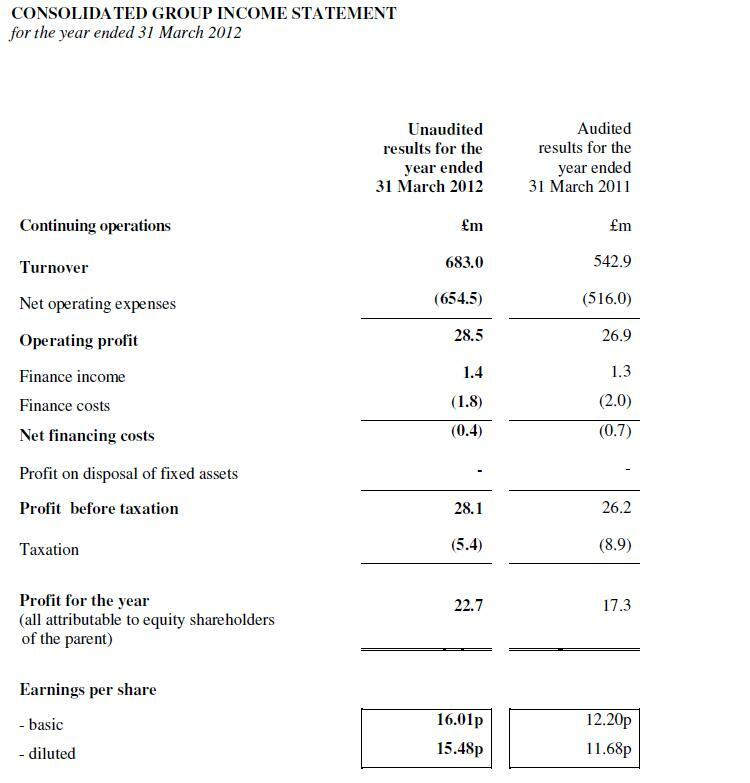 Therefore real 2011/2012 earnings for Dart are rather around 9 pence per share and not the 16 pence recorded in the income statement. Still cheap (PE of 9) but not “busting any value yardstick”. Any value investor interested in the total value creation of a company for shareholders should include all items of the comprehensive income statement into his valuation. Many companies are very good in shifting all unpleasant stuff into this section. Especially for financial companies, recorded earnings are more or less meaningless without the items in comprehensive income. Also fuel hedges for airlines or other fuel cost eexposed companies should be viewed as relevant. I agree…and disagree! I won’t debate actual hedging v much, except to say: i) obviously, there’s an ‘expense’ to hedging, but it’s a valuable financial tool in the short-medium term – but longer-term an adaptible business model is clearly required to deal with volatile financial risks/rates, hedging can’t protect you forever, ii) the lower your margins and/or the more commoditized your business is, the more important a tool hedging will be, ii) evaluating what your industry peers are doing is important too, hedging when they don’t could unfortunately (and a little unfairly) prove to be imprudent. Dart’s treatment of their derivative gains/losses is completely by the book, and is exactly what I like to see. Mostly it comes down to the Matching Principle, one of the most important concepts in accounting: http://en.wikipedia.org/wiki/Matching_principle That is, matching revenues and related expenses in the same accounting period. Unfortunately, in the bad old days, companies (and even banks) took that as a licence to completely ignore the gains/losses on outstanding derivative contracts at a period-end – leading to some well known shocks/disasters over the years. Disclosure is the answer, and it’s ultra important. Booking effective gains/losses through Comprehensive Income is perfectly acceptable to me, and I certainly don’t consider gains/losses recorded there as part of current year earnings/eps. They will show up in the P&L in future accounting periods – exactly as intended – they are a hedge of 2013 fuel purchases, for example. This all of course presumes that these derivatives are actually an appropriate hedge of real exposures (which can change, sometimes significantly), and the company isn’t over-hedging or speculating. Actually, what really helps is the fact that if something’s recorded in Comprehensive Income, it means it’s effective – which lays to rest most of these concerns. All-in-all, some specific companies may require/deserve different/greater disclosure & analysis, but the current compromise of disclosure in Comprehensive Income (rather than inclusion or complete exclusion from Income) is a pretty good solution. The real risk in hedging comes from what the competitors are, or are not, doing. An unhedged competitor might have a significant cost advantage if prices move in his favour. This turns the hedge into a business risk which might be asymmetrical. ie. The unhedged competitor might change his operating structure in order to mitigate cost increases caused by his exposure while the same options are unavailable to the hedged party if their hedge turns sour. It’s also important to know exactly what type of hedges a company has. Chesapeake “fully hedged” a couple of years worth of natural gas production at 2007 prices. Of course management had cheapened the hedges by allowing price floors to be put into those contracts. Below the drop off point of those floors the company remained fully exposed to a drop in the price of natural gas. hedging through forward does not cost a lot. For Dart, a certain amount of hedging makes sense. As they sell their tickets months before the actual flights and cannot retroactively chnge the ticket price, not hedging would be a bet on future fuel prices. does Dart only hedge the amount calculated from already sold tickets with corresponding timeframes? If so I would argue this hedging is operational. I thought of a more rough-cut hedging. At least I would include the cost of hedging as it is not for free to hedge. But I think some of the cost are already included in the reported net profit (e.g. staff for hedging activities). On the long run you can’t hedge anyway. If the oil price sinks Dart will profit regardless of the short-term loss resulting from their hedging activities. If price of oil rises significantly a gain from hedging can’t balance the deteriorated long-term outlook. Personally I like natural hedging and don’t like fx and oil hedging because this highlights a weakness to influence the future competitive ability of the company. If the capital structure is solid why don’t accept some risks? Which why the normalized value should be zero. This is asking the company to carry excess cash. Carrying excess cash costs more than hedging. “Strong” balance sheets, in this sense, are irresponsible. I don’t mean excess cash but rather using a higher equity ratio and ready to use credit lines. Well, in the case of pension liabilities, there is clear a reason to suspect systematic bias. If a company says that its expected return on pension assets is 9%, and those assets are 50% in money market funds, then that’s wrong. The thing to do in that instance is not to wait for comprehensive income nor to use past items in comprehensive income, but to adjust it manually, using a reasonable rate of return. It’s hard to see, however, how fuel and forex hedges can be sysematically biased. Contrary to what I think may be your characterization of them, hedges are not directional bets on oil price: that would not be a hedge, but an amplification of the kind of volatility that the airline is trying to dampen. Hedges are instead option straddles, strangles and the like, that soften the blow as oil prices move up or move down. And snce these hedges are conracted for at regular intervals, fuel prices (and forex, for that matter) will move in unpredictable fashion. Which, again, is why they need to be hedged, rather than bet on in a directional sense. If anything, the only time that one is guaranteed to lose money on a hedge is when oil prices are constant. In any case, I look foward to your post on this topic and thanks for taking the time to reply to my comment. thanks for the comments. Howver i see this quite different. I am not sure if I qualify as value investor, but I only normalize if I have sufficient prove to normalize. For instance in the case of pension liabilities, a normalization of pension charges in the OCI to zero will have led to a lot of bad investments in the past. The reason that Dart has realized a gain in the hedging is that the Oil price has increased continously. To put a “zero” on this implies assuming a constant oil price. I am not sure about that. I wil lhave a post on that soon but I still think that assuming an average zero for OCI is a big mistake in many cases. Hedges and so forth are nonoperating but may, under some circumstances, also be relevant. They are more relevant when normalized across a number of years. Value investors always normalize. And here’s the paradox: unless one has a particular reason to believe that there is a systematic bias in the hedging activity, normalization should yield a zero value. As it happens, Dart has ‘earned” an average of $4.5m from hedging over the last five years; the value ascribed to this should still be zero. It is random noise. Also, some airlines don’t hedge, some hedge only a little, and some hedge a lot; it doesn’t seem to me to be fundamental to the operations of the business, just a way to smooth cash flow and lower one’s cost of capital. It is therefore a financing decision and not an operating one.